Model: The high side gondola has a factory-installed, red blinking LED marker light as a Swiss marker light. The car is loaded with real scale-sized coal. The pair of auto transport cars is loaded with 8 automobiles in different colors. There is a permanent coupling between the car halves. The upper deck can be lowered. Suitable chock blocks to fix the automobiles in place are included. All of the cars have different car numbers and are individually packaged. There is also a master package. Total length over the buffers 75 cm / 29-1/2". 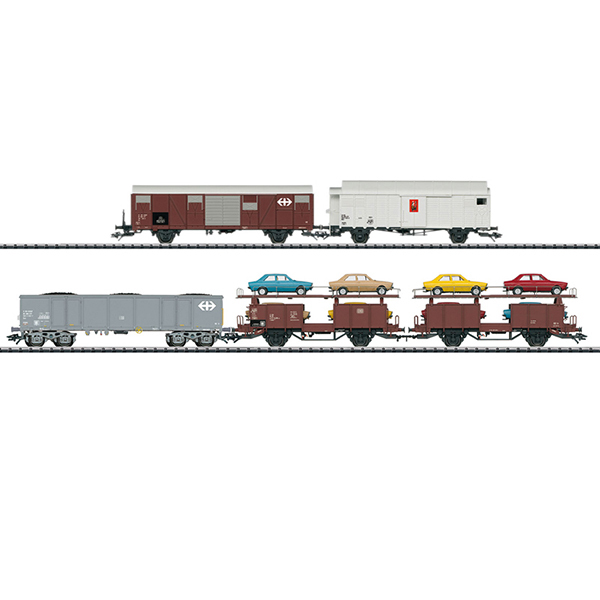 The 23567 freight car set is being produced in 2018 in a one-time series only for Trix Club members.